Augmented reality (AR) is a technology available to everyone that, by using an iPhone or touch tablet, enables you to expand the real information of an object or location with digital information (graphic, audiovisual documents, etc.). Broadly speaking, the mechanism through which the app interprets when it has to load the expanded content is activated by recognition of a static image: the mobile device recognizes the image that it is focusing on and offers the related expanded information. As in this case, the static image may be a physical object of a certain size, but it could also be a 2D image, such as a logo or image on a poster, a page in a catalogue, flyer or notice board. The UOC contacted the museum to introduce the technology to the exhibitions managers and introduce them to the possibilities that AR has to offer by giving an added value to the exhibitions and visitorexperience. The museum rated the initiative positively and decided to start a collaboration project with the UOC to create an AR experience. This experience will help it see how its visitors take to the new technology and, based on the results, decide whether to extend its use within the museum. To create the experience, out of all the pieces at the museum, the skull of the Triceratops was chosen as it was felt that it would be highly attractive to visitors. In terms of the type of experience, it was agreed that this one would allow a photo-realistic animated 3D model of a Triceratops based on skull recognition to be displayed. • User study (interviews with visitors to the museum) to find out their expectations of the type of experience to be developed and which will serve to make the experience more attractive. • Create the 3D animated model, with the maximum fidelity possible, on the real Triceratops skull, on the basis of the collection of photographs. • Generate the digital recognition model, on the basis of an inventory of photographs, which will launch the animated 3D model on a mobile device. • Personalize/modify the experience, taking into account the viewpoint of the end user in the museum (distance from the skull and angle of perspective) from which it is intended to recognize the triceratops skull. • Define the elements that motivate and explain to visitors how to enjoy the experience (information panels, flyers, etc.). The end result has been the creation of an augmented reality experience in which, based on the recognition of a Triceratops skull displayed at the museum, the dinosaur comes to life in 3D with a reproduction of what its habitat might have been like and an approximation of the sound it might have made. The experience has been available at the CosmoCaixa Museum since 23 September 2014. 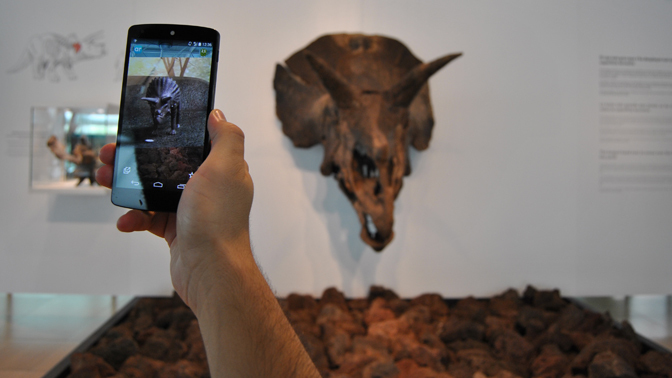 Any visitor to the museum can use their smartphone or tablet to download the Layar app, focus on the Triceratops skull and enjoy the experience. One year after its presentation, the number of visitors that have interacted with the experience is higher than 4.000 people, a result that has been rated very positively by the museum. Such is the case that the museum has decided to continue the collaboration with the UOC to create new AR experiences with the pieces of the exposition "La Tira de la Vida" displayed in the museum.